From 62 to 75 € the night I book ! 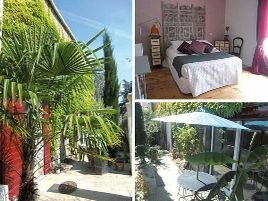 This lovely stone-built house is located just ten minutes from the centre of Nantes, its traditional charm harmonising with modern touches. Small garden, ideal for enjoying the quiet surroundings. The suite is attractively decorated, its style a mix of hindu and french culture. In this little corner of nature not far from the city, breakfasts are homemade and everything has been thought of so that guests enjoy all the attention they deserve. A cheerful, attentive welcome..
1 suite with bath, shower and WC. 62 euros (1 or 2 pers. ), 75 euros (3 pers.). The closest station is Nantes sud, located at 7 km. The closest airport is Nantes Atlantique, to 13 km.